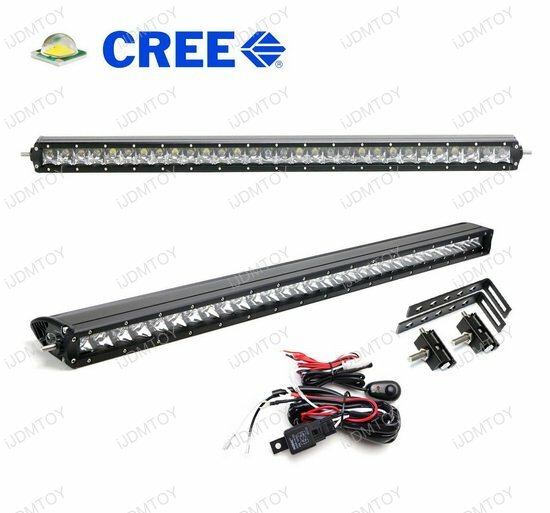 A: The 30" 150W high power CREE LED light bar is designed for the 2014-2018 GMC Sierra 1500 2500 3500 HD and the 2014-2015 Chevrolet Silverado 1500. A: No. 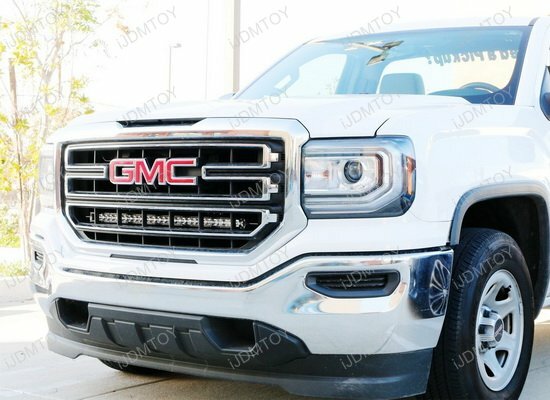 Installing this LED light bar on your GMC Sierra is straightforward; it only requires removing screws to bolt on the mounting brackets and connecting the wires to a power source. A: Although it's not absolutely necessary to wire your LED light bar to a relay harness, we highly recommend that you do so if you don't have one already. 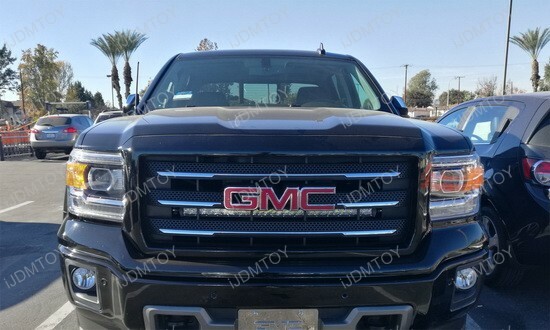 Connecting your LED light bar to a relay harness will protect your GMC's circuits, since the relay harness has a built-in fuse, and ensures that it doesn't overload. 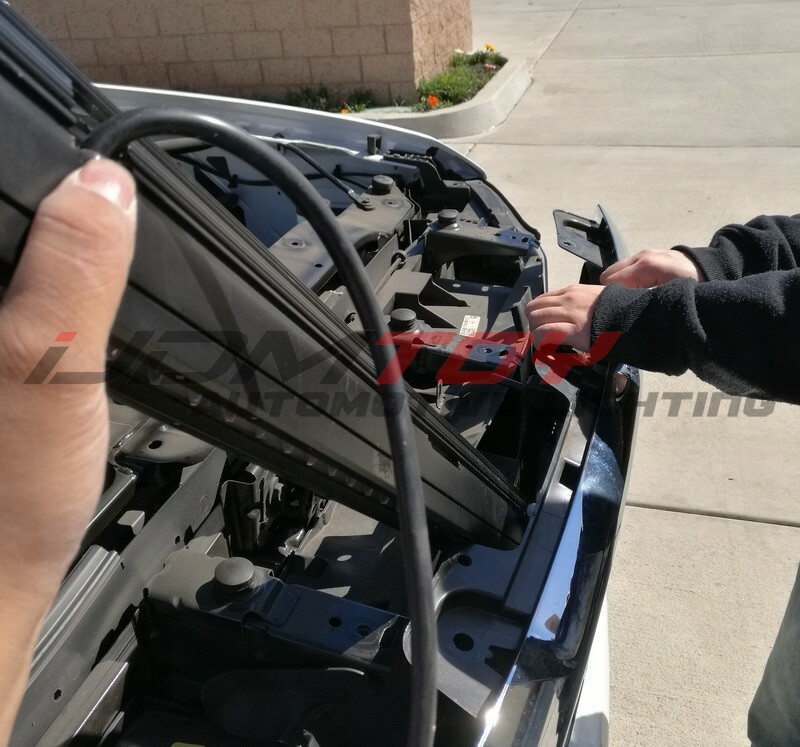 Having your LED light bar connected to a relay harness protects your car battery's longevity; turning your car off also turns off the LED light bar. Additionally, our relay harnesses come with an on/off switch so that you can conveniently switch on/off your LED light bar whenever you need to. Q: How do I install the LED light bar? 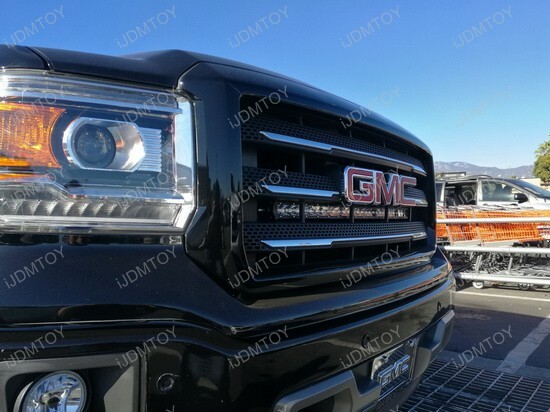 A: Refer to our guide on how to install the 2014-2018 GMC Sierra 30" 150W LED light bar. 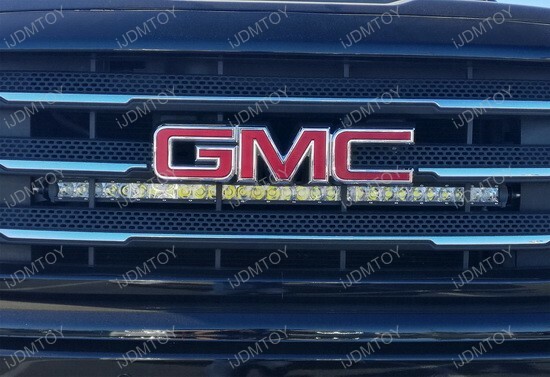 Q: Can I install this LED light bar without removing my grille? 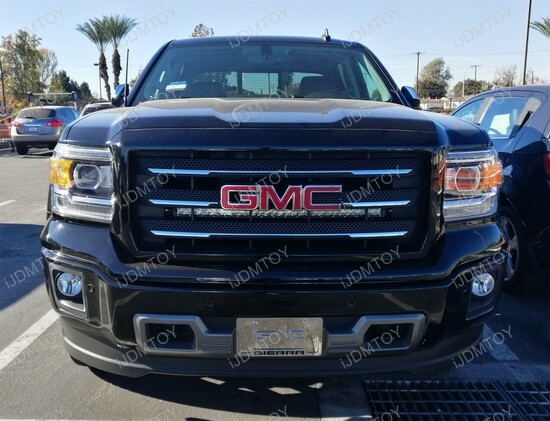 A: If you are working with a GMC Sierra, it's possible for you to pull the grille back to give the LED light bar clearance to drop through. We don't recommend you do this with other makes/models because you risk scratching your LED light bar and breaking parts of your grille. Q: After mounting my LED light bar onto the L-shaped support brackets, I found that it hits the metal flaps behind it or it doesn't align the way I want it to. What do I do? A: Use one of the four other mounting holes on the L-shaped mounting brackets to level your LED light bar. 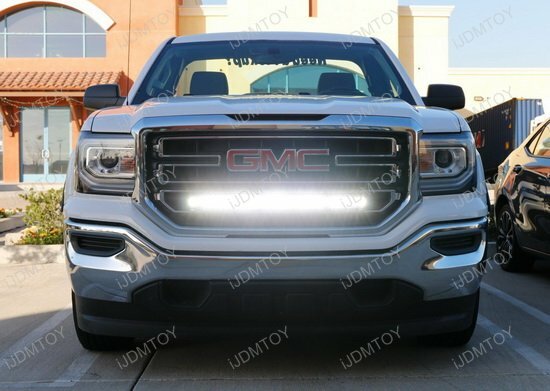 Your grille or fixed metal flaps won't get in the way of the single row LED light bar and you will get full lighting output. 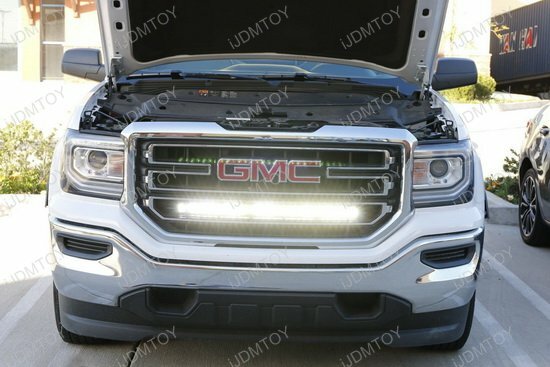 This page features one complete behind-the-grille 30in 150W CREE LED light bar kit for 2014-2018 GMC Sierra 1500 2500 3500 HD. This complete kit comes with one piece extremely bright 30" 150W high powered CREE LED light bar (spot beam pattern) with a set of black powder coated steel behind the grille mounting brackets and wiring harness w/ on/off switch. 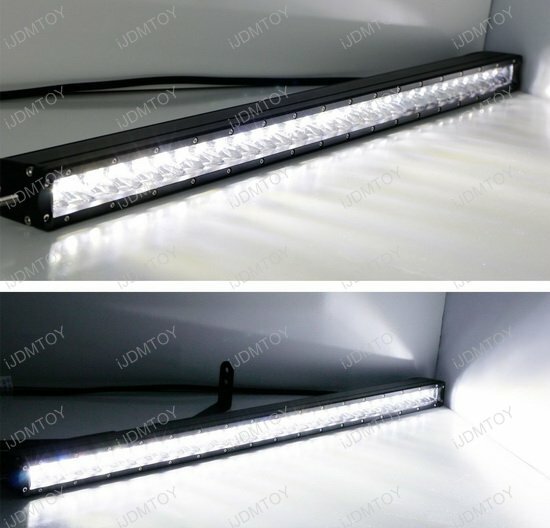 The LED light bar is powered by a 30-inch long single row LED lightbar powered by 30 pieces 5W each CREE LED diodes with an extremely bright lighting output. You can directly mount it to the factory bolts behind the front grille without any drilling, cutting or modification required. 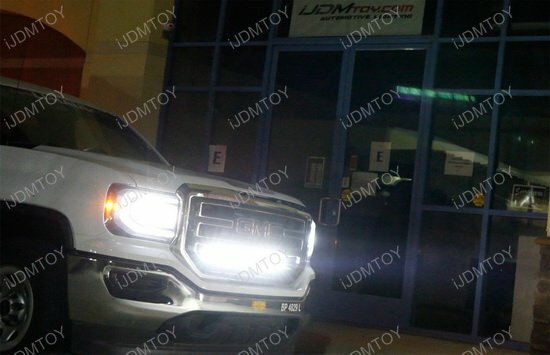 It will give yourSierra a super rugged off-road look and feel both day and night with a superior lighting you ever possibly need! 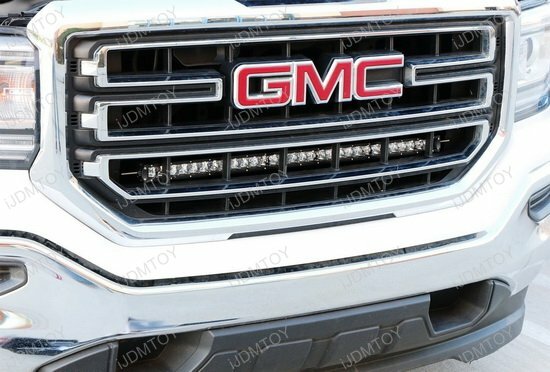 Please note this LED light bar does not fit 2017 trims with air flaps behind the grille. 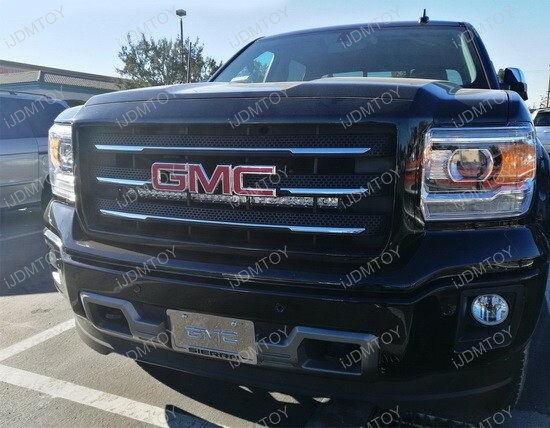 If your GMC truck is equipped with automatic grille shutters, you will have to remove it in order to install the LED light bar. 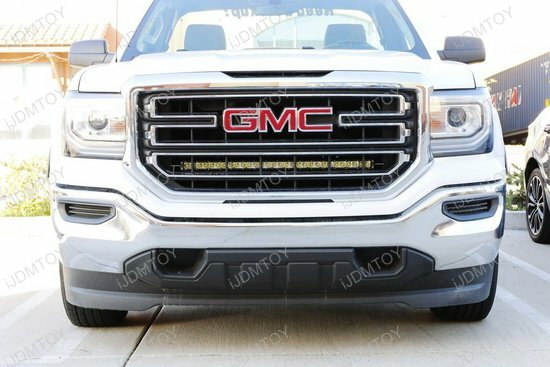 I have a 2017 GMC Sierra SLT with the tabs behind the grill. They were able to hook it up but had to cut the little stiff arms on the grill. The LED light bar looks great and matches the head lights! 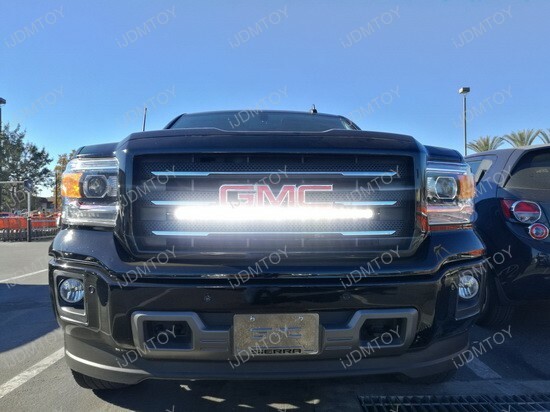 A great LED light bar that's easy to install on my 2017 GMC Sierra 1500.